(Nanowerk News) Using advanced fermentation technology, industrial biotech startup Manus Bio hopes to make manufacturing flavors, fragrances, and other products greener and more cost-effective — and maybe create new products in the process. Most recently, Manus has recreated a natural plant process in microbes to cheaply produce mass quantities of a coveted stevia plant compound for a zero-calorie sweetener, called Rebaudioside M (Reb M), that’s noted for being much sweeter than today’s commercial alternatives. In nature, only .01 percent of the compound can be extracted from the stevia plant, so companies extract a more abundant but more bitter compound. 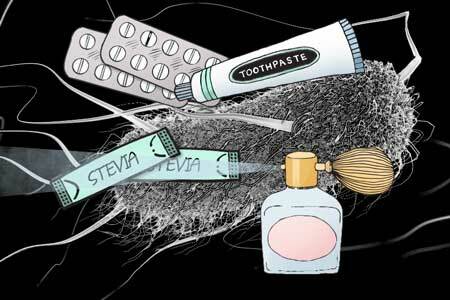 Manus, on the other hand, has engineered bacteria to mimic the stevia plant’s metabolic pathway. When put through the startup’s fermentation process, the bacteria produced the compound at greater than 95 percent purity. Production of the new sweetener demonstrates how Manus’ microbial engineering can be used to make more refined flavors and other products more cost effectively, says MIT professor Gregory Stephanopoulos, who co-founded the startup and co-invented the core technology with former postdoc and current Manus CEO Ajikumar Parayil. On average, Manus’ process is about one-tenth the cost of any plant-extraction method and significantly reduces use of land resources. “If you take the original compound from the stevia plant, it has a metallic taste. But if you isolate the components of the metabolic pathway and find individual compounds, then you end up with the product of the highest interest,” says Stephanopoulos, who serves as a scientific advisor to the startup. Manus’ commercial fermentation process involves engineering microbes with plant metabolic pathways, and placing them into large-scale fermentors with inexpensive sugars to feed on. While fermenting, the microbes produce large amounts of the ingredients that can be extracted with commercial processes. Manus plans to scale up to commercial levels this year and sell the products to their industrial partners. Another product in Manus’ pipeline is a rare compound called nootkatone, a key component found in grapefruit that is used as an environmentally friendly insect repellent. It currently costs several thousand dollars per kilogram to produce through traditional methods. But, produced more cheaply and in greater qualities, it could be used, for instance, as an environmentally safe way to help fight Lyme disease, malaria, zika virus, and other insect-borne pathogens. The core technology traces back to novel work Stephanopoulos and Parayil began at MIT. In the mid-2000s, the two researchers modified the complex metabolic pathway in bacteria that produces isoprenoids, a diverse group of more than 60,000 molecules that are used to make many products, including therapeutics. Tweaking that pathway for commercial purposes has been done before, “but we paid special attention to the amount of product produced,” Stephanopoulos says. In 2010, Stephanopoulos, Parayil, and other MIT researchers published their first paper on the work in Science. In it, they describe engineering microbes with a metabolic pathway of 17 complex intermediate steps that could produce large quantities of critical intermediate compounds of the cancer drug, Taxol, originally extracted from Pacific yew tree bark. To do so, the researchers added enzymes and plant genes to the pathway, which helped catalyze the intermediate steps and eliminate bottlenecks that slowed the pathway. Doing so increased production of the compounds 1,000 times over traditional microbe-engineering methods. A major feature of the paper, Parayil says, was using enzymes to cut the linear pathway into a network of separate, distinct modules that can be more easily controlled and modified — a process referred to as multivariate modular metabolic engineering (MMME). “Basically, the core concept was simplifying the biology for engineering,” he says. Around the same time, a researcher from a company in the flavor and fragrance industry was visiting MIT through the Industrial Liaison Program (ILP) to learn about current innovations. After meeting with Stephanopoulos and Parayil, the representative persuaded her company to fund further development of the technology. In 2012, the two researchers launched Manus’ lab in Cambridge to commercialize the technology. Stephanopoulos points to this initial industrial collaboration, facilitated through the ILP, as a stepping stone in Manus’ success. Apart from funding, the unnamed company provided insights about manufacturing and getting other companies to buy into the idea of novel technologies. “That was one of our competitive advantages. We learned a lot by working with this company from day one,” Stephanopoulos says. On his end, Parayil brought the business idea to MIT’s Innovation Teams (i-Teams) — where students from across disciplines flesh out strategies for turning lab technologies into commercial products — and to the Martin Trust Center for MIT Entrepreneurship, the ILP, and classes such as 15.366 (Energy Ventures), which helped him refine a business plan and contact customers, among other things. “Those were unique experiences that showed how to translate technology from the lab to market,” Parayil says. Today, Manus’ technology has been verified in a number of academic publications, including in Science and PNAS. Along with MMME, the process now incorporates pathway integrated protein engineering, which uses design tools to enable fast and efficient enzyme engineering, and integrated multivariate omics analysis, a suite of analytics tools to uncover bottlenecks in metabolic pathways. Apart from cutting costs and use of land resources, the technology also represents a platform “that can aid in the discovery of new molecules,” Parayil says. In nature, for instance, a compound extracted from a plant represents the end product of long, complex metabolic processes with many intermediate steps. Currently, there’s no way to discover all the compounds produced along the way. Manus, however, can monitor the entire metabolic pathway and identify, tweak, and potentially extract previously untested compounds produced at any stage. In doing so, “you multiply incredibly the number of chemicals that may have very important properties as, say, pharmaceuticals, flavors, and pesticides,” Stephanopoulos says. But that’s further down the road, he adds. This year is “particularly critical” for Manus, Stephanopoulos says. The Cambridge-based startup is currently ramping up production for commercialization of the sweetener and other products. “If Manus demonstrates the ability … to produce compounds at commercial scale, it will seal the credibility of company as a serious contender in the area of biotechnology and … fragrance, flavor, and sweetener manufacturing,” he says.